I first wrote about the LegalBoard last January, and later followed that post with a hands-on review and a video unboxing. Recently, Brian Potts, the lawyer who conceived of the LegalBoard, sent me a review unit of the new mini version, called the LegalPad. The idea of the original LegalBoard was to save keystrokes for lawyers by designing a keyboard that had keys for the functions lawyers frequently use, such as inserting a section sign (§) or common citation terms such as F.3d. The LegalPad takes mostly the same functions and arranges them in a separate pad that plugs into a USB port. No set-up is required — just plug it in and it works. It is compatible with both PCs and Macs. If you press shift while pressing any of these word keys, the word is capitalized. So if I tap the supreme court key, it is lowercase, but if I press shift plus the key, it is Supreme Court. Turn small caps on and off. Start or close the find window. Add a footnote or return to the text from a footnote. Add a comment or return to the text from a comment. Turn Track Changes on and off. Pressing the number-lock key on the LegalPad turns off its legal functions and enables it to be used as a number pad. There are two differences between the LegalBoard and the LegalPad. The keyboard includes keys for setting line spacing, while the pad does not. The pad includes keys for inserting em and en dashes, which the keyboard does not. The LegalPad can be purchased for $59.99 from the LegalBoard website. 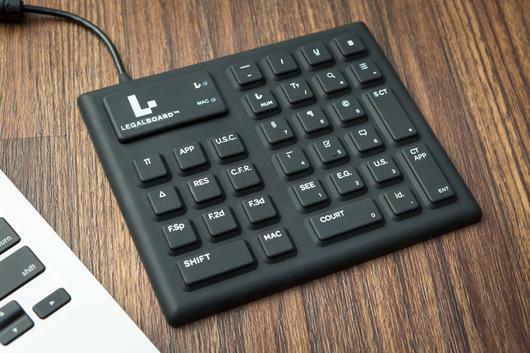 The original legal keyboard can be purchased for $75 from the LegalBoard website or for $79.99 from Amazon. It is roughly 6.4″ by 5.25″ in size. If you frequently write legal briefs and memoranda, the LegalPad is a handy accessory that can save you keystrokes or time spent figuring out how to insert a symbol. At this time of year, it is also a good holiday gift for your favorite lawyer — or yourself.